Home › Ferruginous duck › Baer's pochard - Aythya baeri. Baer's pochard (Aythya baeri) is a medium sized diving duck belonging to the family Anatidae. Baer's pochard species is distributed in Indian Subcontinent, China, Japan, Russia and Vietnam. 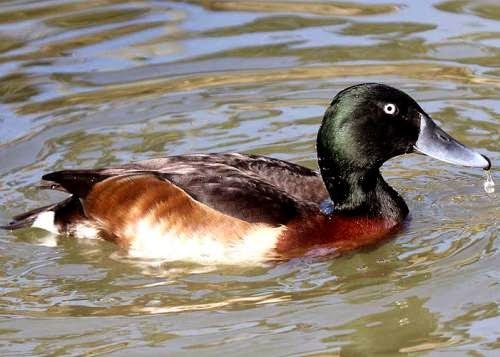 Aythya baeri was previously included in the genus Anas. These pochard species are considered closely related to A. australis, A. innotata and A. nyroca. Baer's pochard species are medium sized, measuring 40 to 45 cm in length and weighing 850 to 900 grams. The female pochard is slightly smaller than the male. The wingspan is 70 to 80 cm. The head, upper neck and back are blackish. The bill is grey. The upper flanks and breast are chestnut. The lower flanks and belly are whitish. The eyes are whitish. These pochard species inhabit water bodies with rich aquatic vegetation. They occur in freshwater bodies, rivers, freshwater lakes, reservoirs and coastal habitats surrounded by thick vegetation. These pochard species feed on aquatic plants, grains, seeds, roots, bulbs and grasses. They also feed on invertebrates, insects, crustaceans, molluscs, frogs and small fish. These pochard species nest on ground among thick vegetation. They also nest on floating vegetation. Baer's pochard species breed the Amur and Ussuri basins in Russia and north-eastern China. These pochard species move southwards for wintering in eastern and southern mainland China, India, Bangladesh, Myanmar, Japan, Vietnam. There is sharp decline in wintering populations. These pochard species breed in Russia and China and move southwards in September–October for wintering. There is rapid decline in Baer's pochard population in the last three generation. The total population is likely to be less than 1,000 birds. These species are critically endangered. Habitat degradation, hunting and drying up of breeding grounds are the major causes for the decline. The IUCN (International Union for Conservation of Nature) has categorized and evaluated these pochard species and has listed them as "Critically Endangered". Current topic in Birds of India: Baer's pochard - Aythya baeri. Home › Common pochard › Ferruginous duck - Aythya nyroca. The ferruginous duck (Aythya nyroca) is a medium sized diving duck belonging to the family Anatidae. The ferruginous duck species is distributed in Indian Subcontinent, Asia, Africa and Europe. Aythya ferina was previously included in the genus Anas. These duck species are considered closely related to A. australis, A. innotata and A. baeri. The ferruginous duck species are medium sized birds, measuring 35 to 40 cm in length and weighing 450 to 750 grams. The wingspan is 60 to 65 cm. Both the males and females are dark chestnut colored. The backs are darker. The belly and undertail region is white. The male ducks have a distinctive pale yellow iris. The ferruginous duck species inhabit shallow wetlands with emergent and littoral vegetation. They occur in marshes, swamps, pools, ponds, mudflats, fish ponds, reedbeds and sheltered coastal habitats. The ferruginous duck species feed by diving or dabbling. They are omnivorous and feed on aquatic plants, invertebrates, insects, molluscs, crustaceans and small fish. They usually feed during the night. The breeding season of these ducks is mainly from April to June. The nest is constructed as a low platform on reeds and other plant matter placed on the ground close to water edge. The nest may also be made as floating platform on floating vegetation. 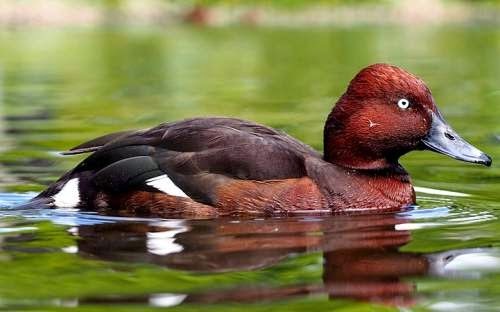 Breeding populations of the ferruginous duck species are present in central and eastern Europe including Romania, Croatia, Azerbaijan, Turkey, Russia, Hungary, Serbia and Ukraine. In south-western Asia, breeding populations occur in Mongolia, Kazakhstan, China and Indian Subcontinent including Pakistan, India and Bangladesh. In Africa, these duck species occur in Egypt, Algeria and Nigeria. The wintering range extends to the Middle East, north-east and West Africa and South-East Asia. These ferruginous duck species are partially migratory. Winter migration occurs from early September to mid-October. The migration to the breeding grounds takes place from March onwards. The global population of the ferruginous duck species is estimated to be 163,000 to 257,000 birds. There have been rapid decline in the duck population in Europe. Hence it is currently listed as near threatened. The conservation threats include, habitat degradation, draining of wetlands, human activity in the breeding grounds, agricultural pollutants, introduced predators and fishing activities. 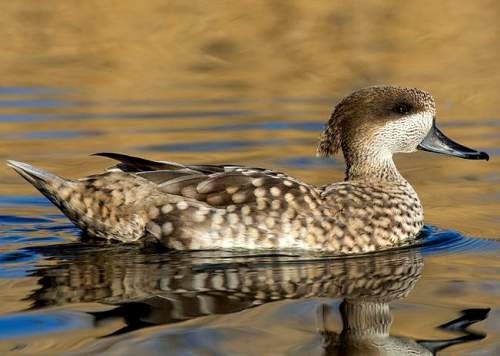 The IUCN (International Union for Conservation of Nature) has categorized and evaluated these duck species and has listed them as "Near Threatened". Current topic in Birds of India: Ferruginous duck - Aythya nyroca. Home › Pink-headed duck › Common pochard - Aythya ferina. The common pochard (Aythya ferina) is a medium sized diving duck belonging to the family Anatidae. The common pochard species is distributed in Indian Subcontinent, Asia and Europe. Aythya ferina was previously included in the genus Anas. The common pochard species is considered closely related to the canvasback (A. valisineria). The common pochard is medium sized bird and the male is slightly larger than the female. The male measures 40 to 50 cm in length and weighs 600 to 1,250 grams. The female pochard weighs 450 to 1,100 grams. The wingspan is 70 to 80 cm. The male pochard has a long dark bill with a grey band. The head and neck are red and the breast is black. The back is grey. The female is brown bodied and has a narrow bill band. The common pochard species prefer open waters, less than six meter depth with abundant submerged macrophytes and emergent vegetation. They inhabit marshes, lakes, slow flowing rivers, reservoirs, sheltered coastal bays, lagoons and tidal estuaries. The common pochard species feed during the evening and night by diving or dabbling. They feed on aquatic invertebrates, aquatic plants, small fish and molluscs. The breeding season is during April and May. The nest is constructed on the ground near water edge concealed in waterside vegetation. They may also nest on floating mat of reeds. The pochard species are distributed in Europe and northern Asia. The pochard species migrate to Africa, South and East Asia and Indian Subcontinent for wintering. Populations in parts of Europe with milder climate are sedentary. The northern population of the pochard species is highly migratory. They move southwards for wintering. Those pochard birds breeding in milder climates are sedentary. They only make short local dispersals in search of feeding grounds. The global population of the common pochard species is estimated to be 2,200,000 to 2,500,000 individual birds. Considering the extremely large range and size of the population, there is least concern in conservation. Hunting, disturbances from human activity, habitat destruction, eutrophication of wintering grounds, entanglement and drowning in fishing nets and nest predation are some of the conservation threats to these species. These birds are susceptible to avian influenza. 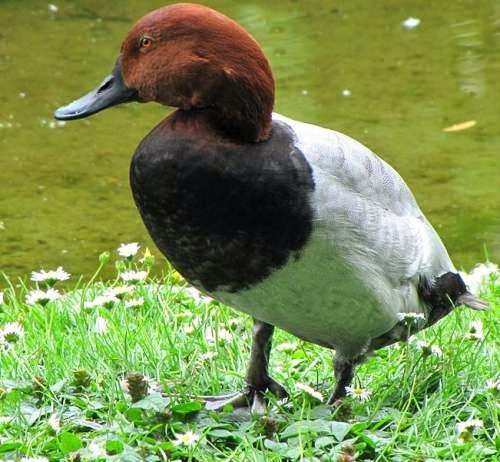 The IUCN (International Union for Conservation of Nature) has categorized and evaluated these pochard species and has listed them as of "Least Concern". Current topic in Birds of India: Common pochard - Aythya ferina. Home › Red-crested pochard › Pink-headed duck - Rhodonessa caryophyllacea. The pink-headed duck (Rhodonessa caryophyllacea) was a medium sized diving duck belonging to the family Anatidae. The pink-headed duck species was distributed in India, Bangladesh and Myanmar. Rhodonessa caryophyllacea was previously included in the genus Anas. The pink-headed duck species is considered closely related to the red-crested pochard (Netta rufina). The pink-headed duck was a medium sized bird, measuring 60 cm in length and weighing 800 to 1000 grams. It had a long neck and the head and most of the neck were deep pink. The plumage on the fore neck and rest of the body was deep brown. The bill was rosy. The females were dull brown colored. These bird species inhabited lowlands, ponds, swamps and marshes with dense vegetation. These bird species might have fed on aquatic invertebrates, aquatic plants and vegetation. These duck species might have bred during summer months. The eggs of these birds were nearly spherical. 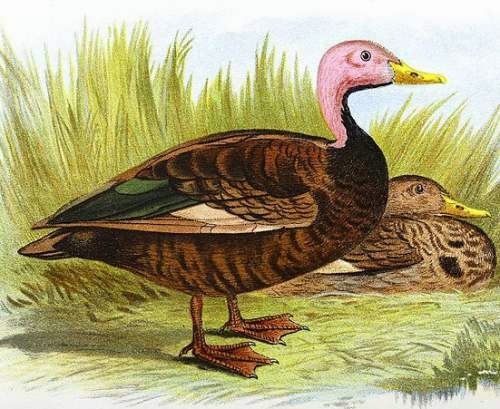 The pink-headed duck was recorded to occur in eastern India, Bangladesh and northern Myanmar. These duck species were resident birds in the areas of their distribution. They might have taken local movements in search of feed. The last recorded observation of pink-headed duck in wild was in 1949. Even the captive birds also existed around the same time. There were reports of unconfirmed sightings in Kachin State, Myanmar. Several surveys had been done to confirm its existence. A. W. Tordoff et al. concluded in their study that "On balance, therefore, there are several reasons for believing that Pink-headed Duck may still persist in the lowlands of Kachin state and, perhaps, elsewhere in Myanmar.Hunting and habitat degradation were the main reasons in losing these bird species. The IUCN (International Union for Conservation of Nature) has categorized and evaluated these duck species and has listed them as of "Critically Endangered". Current topic in Birds of India: Pink-headed duck - Rhodonessa caryophyllacea. Home › Marbled teal › Red-crested pochard - Netta rufina. The red-crested pochard (Netta rufina) is a medium sized diving duck belonging to the family Anatidae. 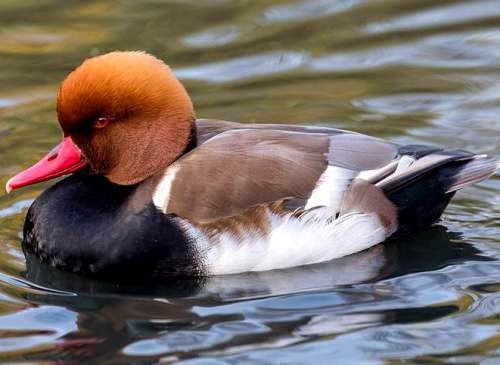 The red-crested pochard species is distributed in Europe, Asia, Africa and Indian Subcontinent. Netta rufina was previously included in the genus Anas. It was also placed in genus Rhodonessa. The red-crested pochard species is considered as a link between dabbling ducks (Anatinae) and pochards (Aythyinae). The red-crested pochard is a medium sized bird and the males are slightly larger than the females. The male pochard measures 50 to 60 cm in length and weighs 900 to 1450 grams. The female bird weighs 800 to 1400 grams. The male had a round reddish-chestnut head, pinkish-reddish bill and black breast. The flanks are white and the back is shades of brown. The tail is black. The female bird is pale brown with darker back and crown. The face is whitish. A wheezing 'veht' call can be given by the male. These pochard species inhabit deep fresh or brackish water bodies. They occur in reed-fringed lakes, rivers, lagoons, estuaries, rivers, streams and sheltered coastal habitats. These pochard species feed by diving or dabbling. They feed on aquatic plants, roots, shoots, tubers, seeds and grains. They actively feed during early morning and evening. The red-crested pochard species nest on the ground near the water edge among thick vegetation. They breed from mid-April to early-June. They lay between 8 to 12 pale green eggs. Breeding populations of these pochard species occur in Europe and Central Asia. These birds winter in the Indian Subcontinent and Africa. The red-crested pochard species were introduced into British Isles and a successful breeding population is established there. The red-crested pochard species are partially migratory. The northern birds migrate to the Indian Subcontinent and Africa for wintering. There is also post-breeding local dispersal. The two main threats to this species are habitat degradation and hunting. These birds are hunted in Iran for recreational and commercial purposes. The red-crested pochard species is susceptible to avian influenza. Current topic in Birds of India: Red-crested pochard - Netta rufina. Home › Malayan night heron › Northern shoveler - Spatula clypeata. The northern shoveler (Spatula clypeata) is a medium sized dabbling duck belonging to the family Anatidae. The northern shoveler species is distributed in Northern America, Europe and Asia. Wintering populations occur in Southern Europe, Southern and Eastern Asia, Indian Subcontinent, Africa and South America. Spatula clypeata is considered to be close to S. rhynchotis. Spatula clypeata (del Hoyo and Collar 2014) was previously included in the genus Anas. The northern shoveler species are medium sized birds, males measuring 40 to 55 cm and weighing 500 to 1100 grams. The female birds are smaller and weigh 450 to 750 grams. The wingspan is 70 to 85 cm. The breeding shoveler drake has an iridescent dark green head. The belly and flanks are white. The breast is reddish chestnut. The speculum of shoveler drake is green. The pale blue fore wing feathers have white border, separating them from speculum. The long broad bill is gray and is tinged orange on the cutting edge and lower mandible. The northern shoveler species inhabit shallow lakes and water bodies with emergent and fringe vegetation. Wintering shoveler birds are seen in freshwater and brackish water bodies. They also occur in marshes, mudflats, estuaries and coastal habitats. The broad flat bill has lamellae on the edge of the bill which acting like sieves, helping in filtering crustaceans and plankton from the water's surface. 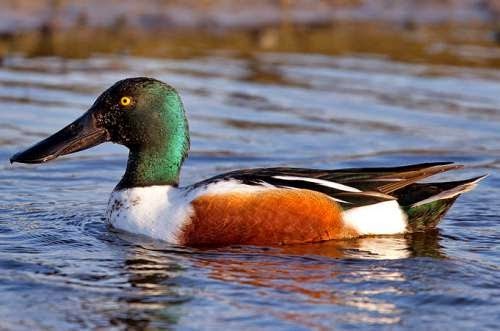 The northern shoveler species feed on invertebrates, aquatic insects, crustaceans, molluscs and aquatic vegetation. The northern shoveler species nest on the ground among dense grass or reeds. The breeding season is during April and May. The shoveler lay up to nine eggs. The breeding populations occur in North America, North Europe and North Asia. Wintering shoveler populations are found in Central and South America, Southern Europe, Africa, Indian Subcontinent, China and Southeast Asia. The northern shoveler species is highly migratory and the birds from North America move to South America and Central America for wintering. The North European shoveler birds move southwards up to Africa for wintering. The birds from North Asia move to Indian Subcontinent, East Asia, and Southeast Asia for wintering. The global population of the northern shoveler species is estimated to be between 5,500,000 and 6,000,000 individual birds. The global population size and range is very large and hence of least conservatory concern. The shoveler species is threatened by habitat degradation, pollution and hunting. 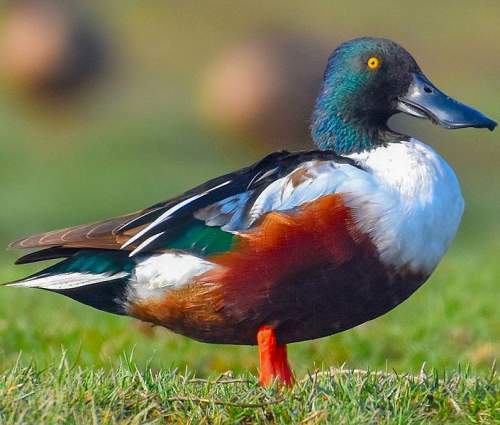 The IUCN (International Union for Conservation of Nature) has categorized and evaluated these northern shoveler species and has listed them as of "Least Concern". Current topic in Birds of India: Northern shoveler - Spatula clypeata. Home › Garganey › Malayan night heron - Gorsachius melanolophus. The Malayan night heron (Gorsachius melanolophus) is a medium sized heron belonging to the family Ardeidae. The Malayan night heron species is distributed in southern and eastern Asia and Indian Subcontinent. Breeding populations occur in India, Bangladesh, Taiwan, China and Philippines. Gorsachius melanolophus is closely related to G. goisagi. The two recognized subspecies are: G. m. melanolophus (Raffles, 1922) and G. m. minor Hachisuka, 1926. The Malayan night heron species is a medium sized bird, measuring 45 to 50 cnm in length and weighing 350 to 450 grams. The wingspan is 80 to 85 cm. The adult herons have reddish brown plumage with streaked underparts, black underwings and a black crown. The bare skin between the eyes and beak is blue, sometimes greenish blue. The crest of male Malayan heron is dark. The vocal call include "arh, arh" and “kwok”. The Malayan night heron species inhabit wooded streams, marshes, swamps, ponds and lakes in subtropical and tropical regions. The Malayan night heron species feed on insects, frogs, invertebrates, crustaceans, molluscs, small reptiles and small fish. In South India, these heron species breed during the rainy season. In Northeast India, they breed during October and November. They nest on the forest trees. The subspecies G. m. melanolophus occurs in Southwest India, Northeast India, Bangladesh, East and South China, Taiwan, Southeast Asia and Philippines. Wintering populations occur in Sri Lanka, Malay Peninsula and Indonesia. The subspecies G. m. minor occur in Nicobar Islands in India. 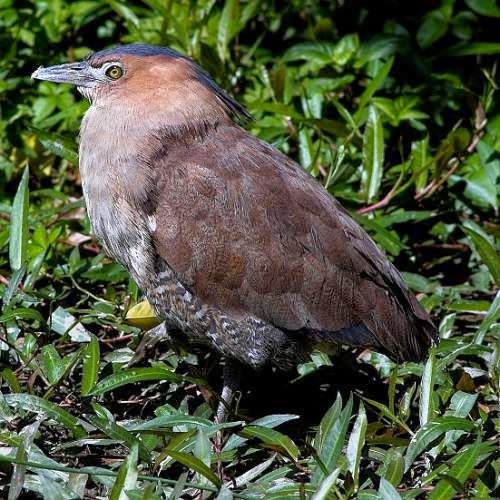 The Malayan night heron species are partially migrant. The South Indian populations are observed to migrate to Sri Lanka. The global population of these heron species is estimated to be 2,000 to 20,000 individuals. The main threat in conservation is habitat loss. The IUCN (International Union for Conservation of Nature) has categorized and evaluated these Malayan heron species and has listed them as of "Least Concern". Current topic in Birds of India: Malayan night heron - Gorsachius melanolophus.